Did you know that a chrysalis and a cocoon are not the same? If this is not a surprise to you, great! But if this fact surprised you, don’t worry. You are not the only one who can’t tell the difference between a chrysalis and a cocoon. In this article, we will discuss the many differences between the two and why they should not be interchanged. 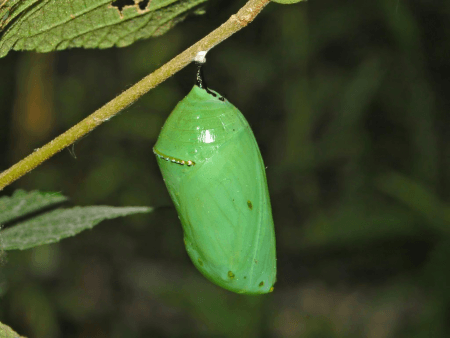 A chrysalis is the hard skin that covers a butterfly pupa before it finally becomes a full-grown or adult butterfly. When a butterfly larva is ready to transition into a pupa, it stops eating and then spins a pad of silk. This pad of silk has a velcro-like characteristic and is used by the caterpillar to attach itself to a twig or a leaf in an upside down or a “J” position. The caterpillar then “molts” or sheds its skin one more time to reveal a pupa. This pupa will then develop a hard outer layer which will become its safety shell while it prepares to transform into a mature butterfly. This protective shell, the chrysalis, usually adapts to the color of its surroundings. On the other hand, a cocoon is a silk casing created by a moth larva when it is ready to transform into a pupa. Since the moth pupa does not have a hard shell, it creates a protective covering around itself by spinning silk instead. This silk cocoon eventually hardens to protect the pupa while it prepares to become a full-grown moth. A cocoon can be soft or hard, transparent or opaque, solid or meshlike depending on the species of moth creating it. Some moth caterpillars use not only silk but also their larval hairs in making the cocoon, and others incorporate twigs and leaves to create a camouflage effect. Cocoons can be found hanging from a leaf or twig, in a crevice, or even on a tree branch. What, then, is the difference between a chrysalis and a cocoon? The greatest difference between the two is that a chrysalis is the protective outer layer of a butterfly pupa, whereas a cocoon is the silk casing spun by a moth larva around itself. 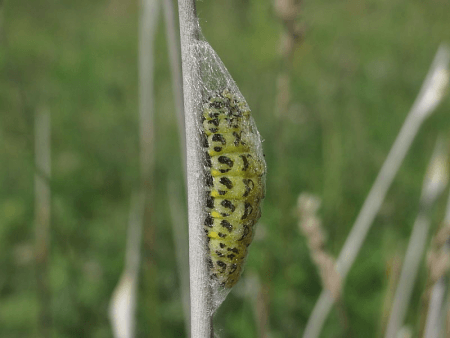 A chrysalis is opaque, hard, and shell-like, whereas a cocoon can be soft or hard, opaque or transparent, depending on the moth species creating it. Moreover, a chrysalis is usually found hanging from a twig, leaf, or branch, whereas a cocoon can be found on the ground, in crevices, or on a tree trunk.